A tenured professor in the Department of Mechanical and Aerospace Engineering, S. S. Rao has taught at the University of Miami since 1998. MIAMI, FL, August 28, 2018 — Marquis Who's Who, the world's premier publisher of biographical profiles, is proud to present S. S. Rao (Singiresu Sambasiva Rao), PhD, with the Albert Nelson Marquis Lifetime Achievement Award. An accomplished listee, Dr. Rao celebrates many years' experience in his professional network, and has been noted for achievements, leadership qualities, and the credentials and successes he has accrued in his field. As in all Marquis Who's Who biographical volumes, individuals profiled are selected on the basis of current reference value. Factors such as position, noteworthy accomplishments, visibility, and prominence in a field are all taken into account during the selection process. A tenured professor in the Department of Mechanical and Aerospace Engineering, Dr. Rao has taught at the University of Miami since 1998. During this time, he also served as chair of the department for 13 years. Dr. Rao formerly taught as a professor in the School of Mechanical Engineering at Purdue University between 1985 and 1998 and in the Department of Mechanical of Engineering at Indian Institute of Technology in Kanpur between 1971 and 1984. While teaching at the University of Miami, Dr. Rao has been responsible for assisting 35 PhD students attain their degrees. Over the course of a near 50-year period, he has also contributed over 350 technical papers in scholarly journals (150 in conferences), many of which were considered “original and trendsetting” by the American Society of Mechanical Engineers (ASME), as well as chapters to 14 books, including the “Encyclopedia of Vibration.” Notably, eight of his engineering books have become world famous and are currently being used by many of the top universities in the U.S. and around the world. 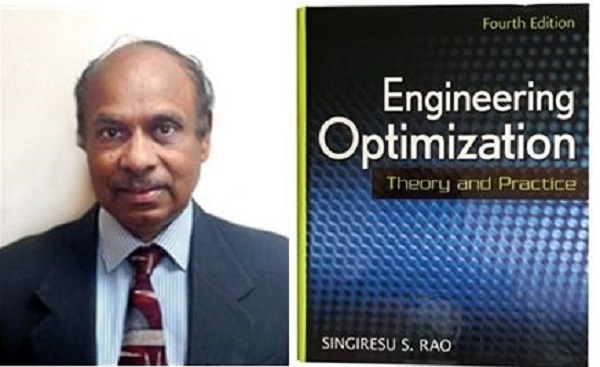 Dr. Rao's research interests include multi-objective optimization, uncertainty models in engineering analysis, design and optimization, reliability-based design, finite element and meshfree methods and optimization and reliability of renewable energy systems. A visiting scientist at NASA Langley Research Center in 2000 and 2001, Dr. Rao is an elected fellow of the ASME. He was also recognized as an associate fellow of the American Institute of Aeronautics and Astronautics. Likewise, Dr. Rao was a visiting summer faculty member at NASA Glenn Research Center in 1997. Dr. Rao holds a Bachelor of Engineering from Andhra University in Visakhapatnam, India since 1965. While studying here, the university ranked him with the highest grade-point among students in all the branches of engineering, and presented him with a gold medal. He then earned a Master of Technology at the Indian Institute of Technology in 1968. Dr. Rao concluded his studies with a Doctor of Philosophy at Case Western Reserve University in 1972. Receiving the Worcester Reed Warner Medal for Outstanding Contributions to Permanent Literature of Engineering from the ASME in 2013 has been one of Dr. Rao's highest honors, summarizing both his accomplishments and ambitions in making a difference in the literature of engineering. He also received several other awards over the years, including a Design Automation Award from ASME, an Outstanding Original Contributions to Engineering Award from Telugh Association of North America, an Eliahu L. Jury Best Research Award from the University of Miami, among others. Furthermore, Dr. Rao has been cited in the 66th edition of Who's Who in America. In recognition of outstanding contributions to his profession and the Marquis Who's Who community, S. S. Rao (Singiresu Sambasiva Rao), PhD, has been featured on the Albert Nelson Marquis Lifetime Achievement website. Please visit www.ltachievers.com for more information about this honor.